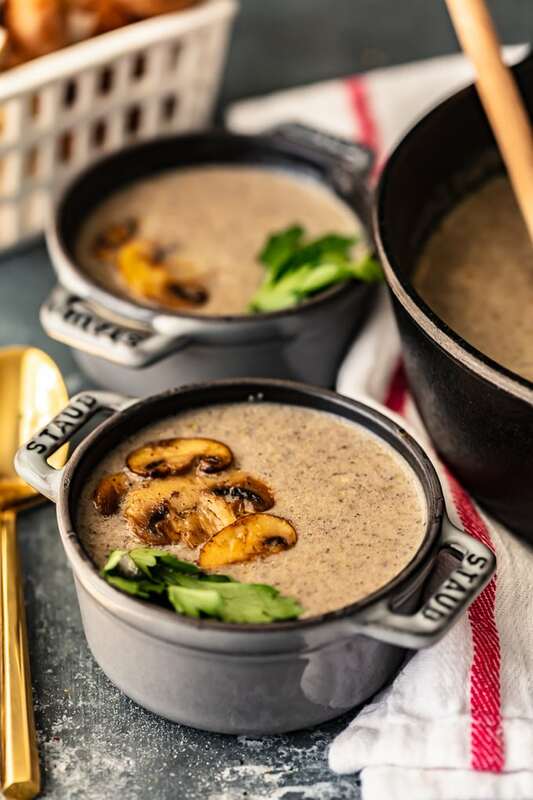 Cream of Mushroom Soup is not only a delicious soup that’s perfect for eating on its own, it’s also a common ingredient in many amazing dishes. This Homemade Cream of Mushroom Soup recipe is way better than the store-bought stuff in a can, and this can easily be prepared and saved ahead of time to use in any recipe! Homemade Cream of Mushroom Soup is the best soup recipe for simple meals, eaten alone, as a side, or as an appetizer. 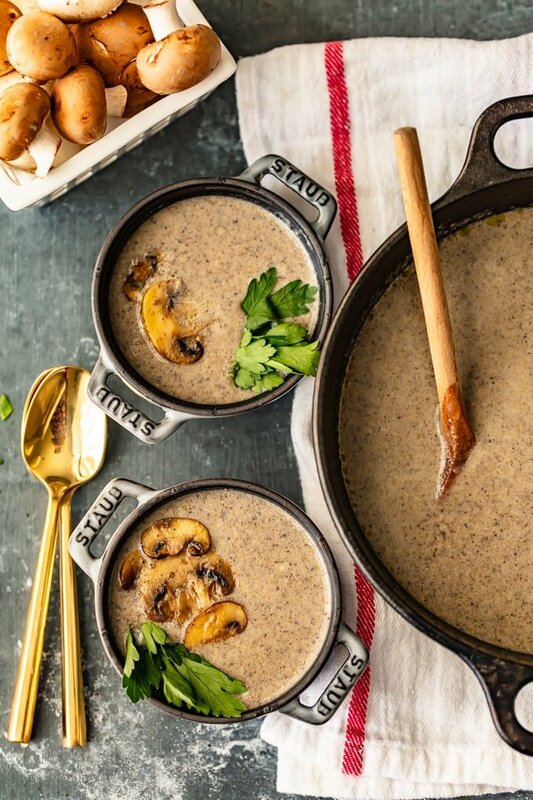 You can also make this mushroom soup to save and use in other recipes! Cream of Mushroom Soup is not only a classic soup recipe, it’s also a classic ingredient in many delicious dishes! It’s creamy, it’s savory, and it has such a rich flavor. This Homemade Cream of Mushroom Soup recipe is so easy to make, and it really comes in handy throughout the fall and winter seasons. I love this stuff as an appetizer before a nice steak dinner, as a side dish along with a sandwich or salad, or even as a whole meal served with hearty bread. Mushrooms, shallots, garlic, half & half, and more combine to make something so simple yet so tasty! This homemade soup recipe is also the perfect thing to make for all of those recipes with cream of mushroom soup in them. 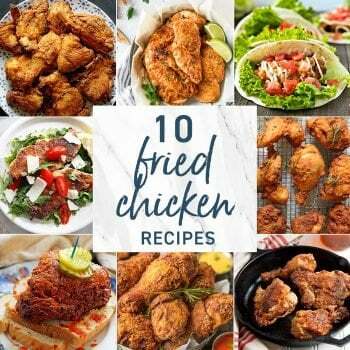 SO many of the best dishes call for it in the recipe, especially holiday recipes! I mean, you can’t make green bean casserole without it, so that makes Thanksgiving impossible without this soup! And why buy a can of it when you can make cream of mushroom soup at home? Just prepare a batch of this soup, freeze it, and you’ll have some on hand any time you see it on your ingredients list. No matter how you eat it, this soup recipe is a definite necessity in the kitchen. Make some ASAP to start preparing for the fall cooking season! 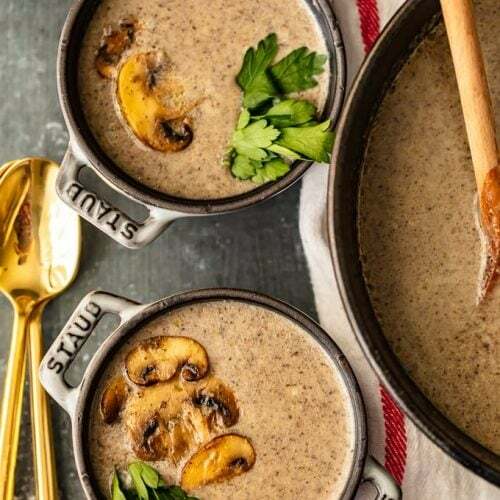 Learn how to make cream of mushroom soup with this simple Homemade Cream of Mushroom Soup recipe. You’ll use this recipe all season long! Since most of use are probably used to buying cans of cream of mushroom soup for cooking (I know I used to), you might be wondering what exactly is in this soup. 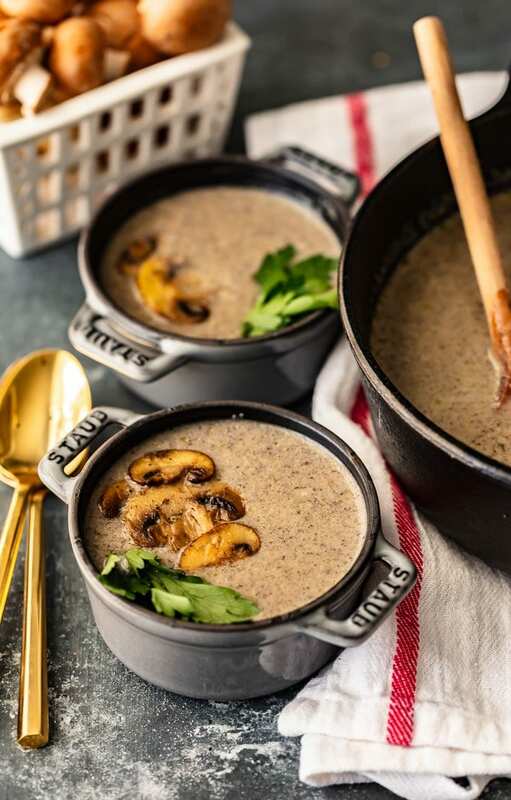 Mushrooms are the obvious ingredient, but it takes a few more things to turn this into a creamy, savory soup that tastes good on its own and as a must-have cooking ingredient. Can’t you just taste the earthy flavor after reading that ingredient list? Yum! Lucky for all of us, this homemade cream of mushroom soup recipe is easy. A simple recipe for a simple soup! Maybe not as easy as opening a can, but it tastes infinitely better. The general outline of the recipe is just adding in your ingredients, letting the soup simmer, using a blender to make it extra smooth and creamy, and then finishing it off by adding in the half & half. Nothing complicated here! Check the recipe card below for detailed instructions. When you’re ready to serve the soup, have some fun with it. Add some fresh thyme leaves on top, slice and saute some mushrooms to throw in for texture, and add in a handful of these homemade croutons for the crunch. If you really want to get fancy, add that perfect layer of cheese on top like you would with French Onion Soup (or like we did with our Parmesan Meatball Soup). After ladling the soup into oven-safe bowls, sprinkle on the cheese (don’t be shy), and put it under the broiler until it gets melty, bubbly, and starts to brown. Cheese makes everything better, after all! And don’t forget some good crusty bread to serve along with it. Whether you plan to eat it as a soup, or just use it as a cooking ingredient, you can easily store your homemade cream of mushroom soup for later use. If you just want to keep it for a few days, up to 3 days in the refrigerator will work just fine. This is a great option if you want to make it a couple days before Thanksgiving and then use it in a few recipes. To freeze cream of mushroom soup: First let the soup cool in the refrigerator for a few hours or overnight, and then transfer it into freezer-safe bags. 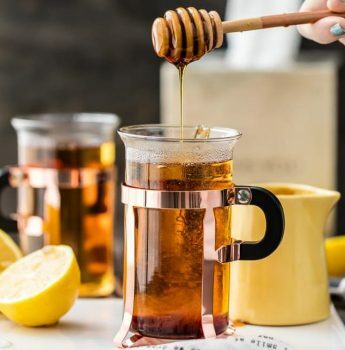 I recommend pouring it into quart-sized bags so that it is portioned off ahead of time, making it easy to store and easy to grab and thaw for individual recipes. It will keep in the freezer up to 3 months. A lot of people think of cream of mushroom soup as an ingredient before ever thinking of it as an actual soup to eat on its own. It’s in so many classic dishes because it has such a great flavor and a beautifully creamy texture. It adds a nice herb-y, savory element to so many recipes! So you can use this homemade recipe in place of the canned stuff for any recipes with cream of mushroom soup in them. 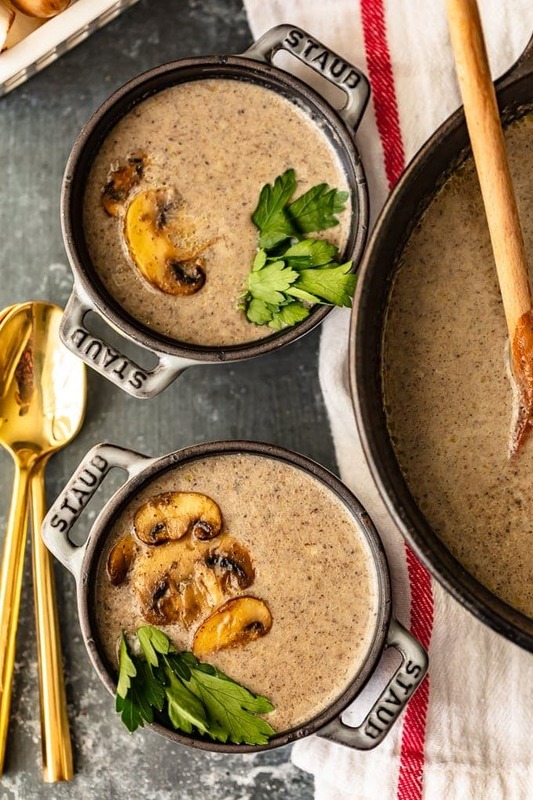 Add this Homemade Cream of Mushroom Soup recipe to your must-make list! Whether you eat it for dinner, as an appetizer, or just use it as an ingredient in other recipes, you’ll surely find yourself making this over and over again. See the recipe card below for details on how to make Cream of Mushroom Soup. Enjoy! 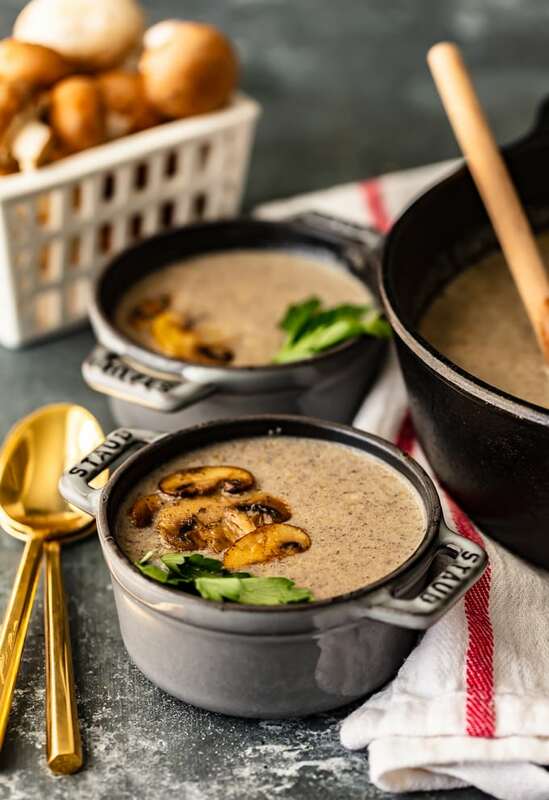 Cream of Mushroom Soup is not only a delicious soup that's perfect for eating on its own, it's also a common ingredient in many amazing dishes. This Homemade Cream of Mushroom Soup recipe is way better than the store-bought stuff in a can, and this can easily be prepared and saved ahead of time to use in any recipe! Heat a Dutch oven over medium heat and add the butter. Heat the butter until the bubbling ceases. Add the shallots and cook 2 minutes and add the sliced garlic. Continue cooking until shallots have softened and are translucent, approximately 2 more minutes. Sprinkle the flour over the onion/garlic mixture, stir and cook 1 minute. Stir in the sherry (with a wooden spoon) and scrape the bottom of the pan to deglaze the pan. Add the stock, salt, pepper, bay leaf and thyme sprigs and bring to a boil. Add the mushrooms and bring back to a boil. Reduce the heat to low and simmer, partially covered, for 30 minutes. After 30 minutes, use an immersion blender to purée the soup until smooth and creamy. Add the half ‘n half and reheat. If serving immediately, ladle soup into bowls and garnish with chopped fresh parsley and toasted, sliced almonds or homemade croutons. If using as an ingredient in other recipes, remove from the heat and cool to touch. Cover and refrigerate up to 3 days. If freezing the soup for later use, refrigerate the soup (covered) several hours or overnight and divide into quart-size, freezer bags. Keep frozen up to 3 months. Hello! What a great recipe, thank you! I’m making this today with your green bean casserole dish for thanksgiving tomorrow :) The green bean casserole recipe calls for 2 cans of this soup, but this dish is measured in cups. How many cups would you say are in “2 cans” ? Thanks again!